Lot of debate is going on whether Browsing be allowed at the work place. 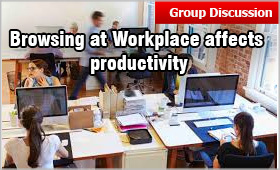 Does it impact the office productivity adversely or should has no adverse impact? The issue has come up for discussion at many places and now B-schools have included this topic in their Group Discussion (GD) round. There is no doubt that browsing at work place goes far enough and it affects the productivity adversely. There are many activities employees do that waste time at work. Excessive meetings, co-worker interactions, office politics, and fixing mistakes are a few. one of the biggest culprits is surfing the Internet. A majority of employees regularly spend time surfing the Internet on websites unrelated to work. Because “time is money,” every hour wasted has a direct negative impact on the bottom line. An important survey conducted on this activity revealed 64 percent of employees visit non-work related websites every day at work. Of that group, 39 percent spend one hour or less per week, 29 percent spend 2 hours per week, 21 percent waste 5 hours per week, and only 3 percent said they waste 10 hours or more doing unrelated activities. On the top of it, a CEO of a big company finds that these figures are underestimated. The has also been revealed which websites keep employees most off-task. Not surprisingly, socializing on Facebook occupy 41 percent, while 37 percent use LinkedIn, and 25 percent are shopping at Amazon. Other destinations include Yahoo and Google+ and to a lesser extent Twitter and Pinterest. The younger, more tech-savvy worker demographic appears to be the biggest group of recreational Web surfers. Of employees between the ages of 18 and 35, approximately 73 percent reported spending time inappropriately at work on a daily basis. The No. 1 reason for slacking at work is that the employees don’t feel challenged enough in their job. Other reasons include; they work too many hours, the company doesn't give sufficient incentive to work harder, they are not satisfied with their career, and they are just bored. There are many ways companies can combat the effect of wasted employee time within their organizations. For example short breaks throughout the day can help them achieve higher levels of productivity. As it relates to inappropriate web site browsing, companies can implement a web filtering tool on company computers to block or track websites not related to work activities, and if you suspect excessive wasted time, the IT group can install an activity-monitoring software to follow all computer activity on a particular PC. Technology savvy people know how to access their favourite websites through smart phones or proxy websites. It needs to be tracked.